This is one of those REALLY easy pie recipes that doesn't even require the use of a mixer. All you need is a bowl and a spoon. Simple, right? 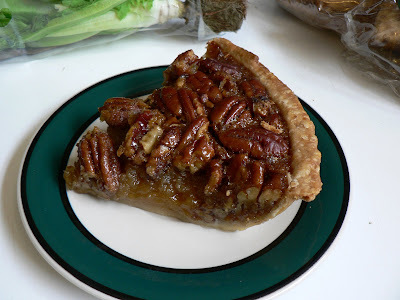 Just stir everything up and pour it into your pie shell. How easy is that?? Heat oven to 350. Roll out pie crust. Dust with flour. Brush away excess. Place crust floured side down in a Pyrex pie plate. Flute edges by crimping them with your fingers. Stir all ingredients together and pour into shell. Bake 50-55 minutes or until set. Serve warm with a scoop of vanilla ice cream or chilled with a dollop of whipped cream. For a little variation, add 1/2 cup chocolate chips!